A simple, sweet recipe that uses leftover haroset. Haroset is one of the most important food components of the Passover seder. Its intense sweetness symbolizes the optimism in contrast to the bitter maror and salty water, which remind us of our ancestors’ suffering. Every family has their own special haroset recipe, and each year my mother makes ours, which is passed down from my grandmother. Our family recipe includes dates, sweet Kiddush wine, and lots of cinnamon. It’s delicious and I always spend the majority of my seder making matzah and haroset sandwiches. Still, there is always a big tub leftover, and no one ever really thinks to use it up once the seders have passed. This year, I’ll be using our leftover haroset to make this chicken recipe. The beauty of this dish is that it works no matter what type of haroset your family makes. The sweetness from the haroset creates an addictive caramelized effect on the chicken. Pre-heat the oven to 400 degrees (200 degrees Celsius). Place the garlic and sliced onions in a medium-sized roasting dish. Dot the lemon rounds around the dish and sprinkle with the thyme. Drizzle with a tablespoon of olive oil. In a separate mixing bowl, toss the chicken pieces with the haroset and add the lemon juice, a pinch of salt and pepper, and 2 Tbsp olive oil. Mix well, allowing the mixture to get under the chicken skin. Place the chicken pieces in the roasting dish, along with the garlic, onions, lemon, and thyme. Pour water in the bottom of the roasting dish and roast for 30 minutes. Turn the chicken pieces over and continue cooking another 15 minutes. 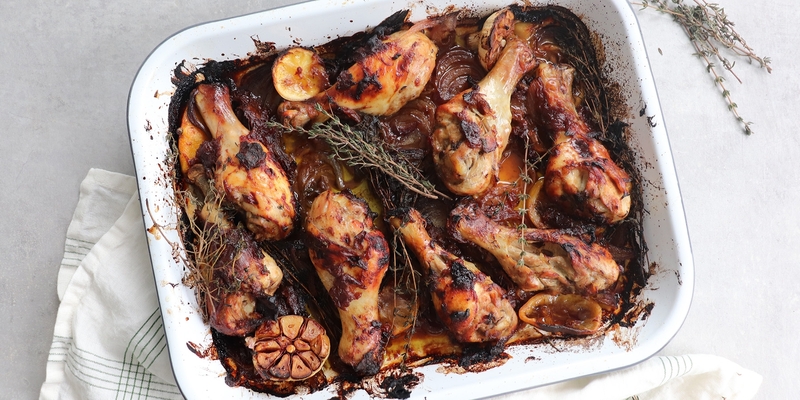 The chicken should be caramelized and crisp and the onions should be softened. There's nothing easier or more delicious than this slow-cooked stovetop soup. These flavors deepen as they are cooked, making them sweeter. Noodles tangle together under a sweet, nutty sauce and combine with shredded grilled chicken for an easy make-ahead dish.